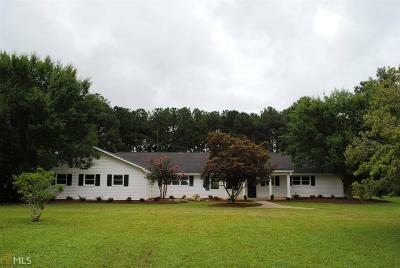 Looking for an excellent house located in a great neighborhood on 5.05 private acres and excellent for country living? This is it. This home has 3 bedrooms 3 full baths and an 18.8 by 19.8 activity room great for games, entertaining or family enjoyment. Open kitchen with many custom cabinets and work island. All new stainless steel appliances including refrigerator. There is a breakfast area and a separate formal dining room. A large utility and Laundry Room is adjacent to kitchen. Carpet is not stained, it is plush pile and shows better in person. In an area of large home sites and convenient to Griffin and Barnesville for shopping, churches and schools. Just a short drive to I75 between Atlanta and Macon. Priced below appraisal.